OA joint–venture company between OSC VN (Oil Service Company of Viet Nam) and CANAM TRIMEX – Canadian Company, with our head office in Ho Chi Minh City and two branches in Ha Noi & Vung Tau. Our operation entails many aspects of the Tourist Industry and the services we have provided including hotel accommodation, night clubs, transportation and tour-visa arrangements along with other services upon requests. 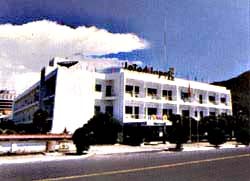 A 3-star international standard hotel – located in the center of Vung Tau City, faces beach and consists 53 bed rooms with full modern facilities, air-conditioners, bath tubes, minibar, In-room personal safes, IDD Telephone lines, CNN and thirteen other Satellite channels for your colored Television, two In-house Video Movie channels - Where you will experience casual luxury and comfort whether you’re a businessman or a tourist. We are confident that we can meet your expectations.